The Unconventional Waltzing Matilda. | A Continuous Lean. 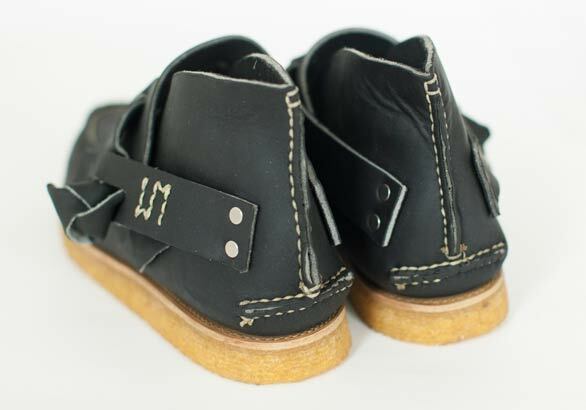 Mike Balitsaris of Waltzing Matilda used to buy toilet factories, but now he’s busy eyeing shoe factories. He’s journeyed from rust belt factories to a Nebraska mine to a Cupertino boardroom to a former shoe factory in Maine, but his goal has always remained the same. Baltisaris sees the potential for creating great things, and creating them right here in America, with all that he does. After a serendipitous moment in Red Wing, Minnesota he founded Waltzing Matilda and has been crafting bags, shoes, belts, and other accessories ever since. A supremely interesting and extremely likeable guy, Mike never set out to create a collection. (Full disclosure, Paul + Williams advises and represents Waltzing Matilda.) All of the product was born originally out of a specific need or a desire for things of a certain quality. What began as a hand-made bag and a pair of sandals has evolved into a collection and a brand with more than its fair share of personality. As our conversation revealed Baltisaris’ story is as winding as it is fascinating, and it’s impossible to predict what lies ahead for Baltisaris or Waltzing Matilda. But he wouldn’t have it any other way. ACL: To begin, I understand that you have pretty interesting backstory, so what were you working on before Waltzing Matilda? MB: Most recently for the last fifteen years, I hired on with a group of likeminded individuals, it had started off as real estate but we didn’t like to take farms and fields and get them redeveloped and put office buildings up. We would go around to rustbelt cities and find these unbelievable projects. Old factories and lofts with good bones. We always called it â€œtaking field trips,â€ and we’d go in and look at the bones of the buildings and we’d work something out where we could figure out how to buy it by getting tenets to go in. We actually would make a deal with the owner to give us time to be able to find a tenant for it, cause none of us had any money. We had a ton of fun, we redeveloped old toilet factories, tire factories, power plants, and all kinds of stuff. We did that up until 2005 and the market just got crazy. Where we were able to get time to buy these buildings, people were now coming in and just beating us out. So then we ended up then buying a sand plant of all things in Nebraska. Long story how that happened. The idea was that we were going to buy aggregate mines – stone and gravel – deplete the stone and gravel enough to create lakes and then build lakefront communities. That was our idea. The guy that I worked with was very creative in that way. Long story short we did that but it also led us to this mine, which was a reclamation mine project, or mine recycling project in Nebraska, where they had all this sand they wanted to get rid of. Lo and behold it turns out that at the same time that we decided to buy this, hydraulic fracturing became popular and they needed an environmentally friendly way to extract oil and gas out of the ground. Sand is the most common material, besides oxygen, on the earth and it happened to be this special glacial sand. It was super round, super hard, perfect to put down into a well. If you ever thought about putting bee-bees in a glass you can still pour water and it goes through. Same way with getting gas back out. So they would pack the well with this sand to hold the hole open and extract the gas out. We did that and we all of a sudden were working with big companies. They wanted us to get more plants, so that’s when I went out to Wisconsin every week and met with farmers seeing if they wanted to sell some sand off their hills. The cool thing about it was, the people that had the sand were the poor farmers because they got the crappy land which had the sand on it. All of a sudden they’re making great money. It was very cool. So I was working between Minnesota and Wisconsin and I stopped in at Red Wing, Minnesota to grab a beer and a sandwich and I looked across the street, it was the Red Wing shoe factory, and a guy was tossing out some scraps of leather. I had used to make sandals way back in the day, and so I always loved leather, the texture of it, working with it. I popped over there and asked the guy if I could have some leather and we made a trade. I gave him some beer and he gave me some leather. As much as I could put in my car and I took it home where I still had some of my old tools from making sandals and stuff. So, I cut little patches and made the first bag. So I was on the next plane out to Cupertino with a pile of leather stuff that I made. I went down and met with them, put the bags on the table, they liked a couple of them, and they said â€œWe like these three, two different colors, three different styles.â€ And I’m thinking they want twenty, twenty-five of them, so I said it would take me a month or so to make them, and we made a handshake on the spot. But it was not twenty-five, they wanted twelve hundred total. And I’m making these out of my garage at the time. So I left there and decided I would have an awesome dinner, go to Carmel-by-the-Sea and just chill out and have the best night ever and listen to good music. So I did, I was like I’ll deal with this tomorrow cause it’s awesome. ACL: So you kept the deal? MB: Oh yeah, I told them I could do it. That’s what I used to do in the real estate world. â€œOh yea I can get it done.â€ Having the order is the hard part. If I have to order every single person in the world and lose money to do it, I’m gonna get this done. So I got up in the morning and I called all the guys I used to buy leather from and I got hooked up with a guy in Brooklyn. He cobbled together a dozen guys and we just cranked them out night and day. Made the first shipment and sent â€˜em out. That was a year ago and we’ve been selling leather goods to Apple ever since. ACL: When you were in Red Wing, had you been thinking about making leather goods again, or was it just a total right place, right time scenario? MB: I had always been making sandals, and I always loved vintage stuff. So when I was doing my traveling, I was always going into pawnshops to find cool jewelry, turquoise, and leather belts. There’s something about vintage leather versus brand new, I think from an artist perspective it’s the texture and the smell, it stimulates all of my senses. I had no idea what I was going to do with it, but I packed my rental car up with as much stuff as I was going to get. I took it back to my hotel and laid everything out. They were different sizes and shapes but I knew I wanted to make a bag because it’s pretty lonely traveling every week and I missed my wife and kids, so I wanted my thing that reminded me home. There wasn’t a big enough piece to make a complete bag so I just started stitching the little pockets together. It made me feel a little better. I just got to that point in my life, I love the guys that I worked with their still my best friends in the world, but I love making art and it just kept pulling me. I was like â€œI got four kids and they’re gonna go to college what am I gonna do?â€ I just have to try it. It’s one of those things where I’m still trying to find my way, find the right people that make things easier, but it feels great. Every Monday morning I used to get cold sweats and now every Monday morning I get up and I look at the next piece that I’m going to make and it’s great. ACL: You’re still making the bags yourself in your garage? MB: Yeah, I have a little studio, basically it’s an attic, but yes. ACL: Do you have people that work for you there or do you also outsource production? MB: I have a woman that used to be with a clothing company so she has some experience in the administrative, operational type role, she just started a couple months ago. I also hired an intern out of Drexel University who is a design major so she is helping me on putting patterns together. I never made a pattern or anything, I just get two pieces together and try to make a match and they never seem to, but it adds to the character of it. Then through a friend that I work with, I found a factory from Maine who had their biggest client move over to Asia, and I was trying to figure out where to make my sandals. We went up together and spent a week up there talking to the group and they agreed to make our sandals. So we’re doing a great part to keep the thirty-five people that work at that factory up and running. And now they’re making shoes for us. ACL: Are all of your stockists in America right now or have you had overseas interest? MB: So far yes. But it’s interesting, I have a company called Nonnative (in Japan), they approached us this summer about doing a collaboration for sandals. We went up to Maine and made a couple sandals and they loved them so we cobranded half a dozen pairs and sent them off. ACL: When you decided that you could do shoes other than sandals? MB: Again, the guy that I worked with, who was my sales guy, he knew the factory up in Maine. We started combing through the catacombs and found all these open dyes and they were just there so we decided to try â€˜em. To make a line of shoe dyes costs thousands and thousands of dollars so we’re like â€œok, let’s try a few pair and see how they do.â€ We made â€˜em using some of the original leather that we found there and they turned out great. We’re taking a conscious effort to take a major margin hit to make them, but to us it’s a piece of art. We aren’t going to make millions selling shoes at basically â€œbreak evenâ€ frankly, but they’re made in America, they’re keeping jobs, keeping people going, it’s just cool. It goes back to finding those treasures that would’ve otherwise been thrown away. ACL: It’s amazing because you used to work in a field that at first feels so removed from this, but you’re basically doing the same thing with clothing. MB: Yea, that’s why when people ask me â€œhow did you go from designing buildings to making shoes and bags?â€ I just say it’s perfectly logical you just have to hear the whole story. ACL: I assume your number one goal then, beyond making great stuff, is keeping it all here in America? MB: Yea. Absolutely. I think one thing that was a fortunate occurrence from a misfortune is that when we were doing our real estate work we were typically going into a factory that was closing down and that’s why they would ask us to come in. So for fifteen years I got to see the last five guys that had worked at this factory for sixty years. They were the last of the tribe. All the equipments gone and it was just these ghost towns inside these buildings. It resonated with me. When these two thousand jobs go away, who the hell is gonna come back in here? The whole idea for me, I believe, not to get too kooky on it, but I believe that drugs and crime and all of the bad things that happen in these small towns is a result of the factories closing down. A lot of it’s boredom, a lot of it’s no other hope, and frankly a lot of it is that having a job to do gave people hope, it gave them pride. It brought the spirits of the whole town up. Again, not to get too crazy on it, but you go into this town in Maine and it’s pretty desolate, but you go into this factory and it’s alive. Having gone into so many factories that were dead, going into a factory that’s humming is phenomenal. ACL: You’re touching a lot of product categories with Waltzing Matilda already but where do you want to go from here? MB: I love sandals and shoes, sandals in particular because they just bring me to my happy place. It’s like the beach, I just think of summer, it’s a good vibe. So I wanna expand that and use some different mediums and textures with that. I love the bags because of travel and I do love to travel. I like to keep it as simple as possible so each time I make a bag I’m trying to make it simpler, not bling it out, but keep it super, super simple. The next thing would be to get some of these collaborations to work. I’d like to scale the business enough to where I could make a living and keep the people that are working, working.